What benefits will SmartTruck provide? Pay-back in under a year! SmartTruck is a sophisticated yet easy to use automated truck weighing system that allows you to process more trucks in less time, saving you and your customers time and money. 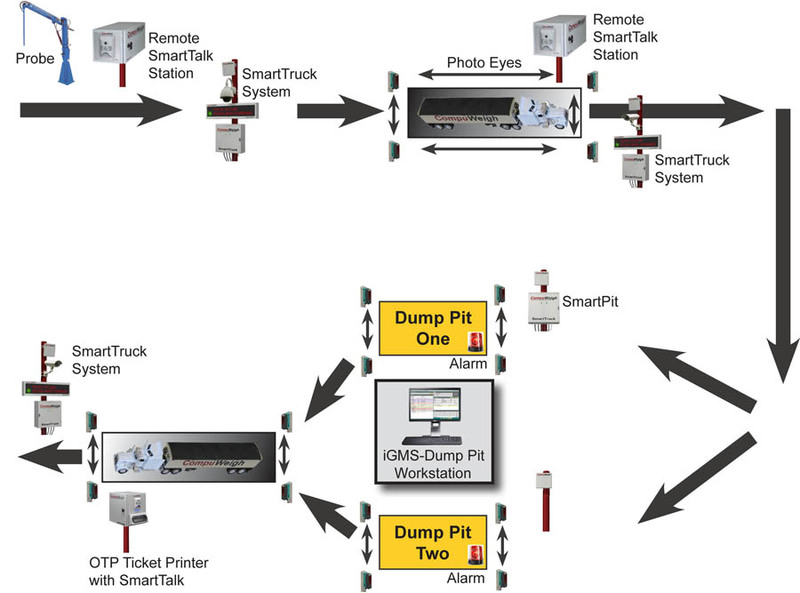 SmartTruck utilizes a combination of long range RF cards, outside message boards, electronic photo eyes, video surveillance cameras, IP based intercom systems, electronic signature pads, driver’s license readers and a powerful computer system configured to your specific needs. 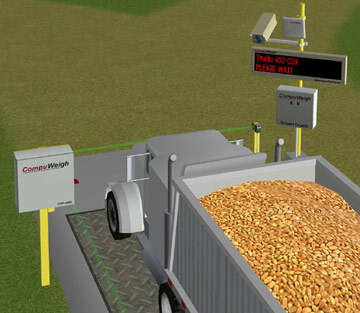 The focus is on automating the whole process of truck receiving and loadout, reducing scale ticketing errors and eliminating the need to employ staff anywhere other than the first point of contact, which is typically the probe station in a grain receiving application. SmartTruck RF Reader is the central component of the system. It provides power to multiple antennas and collects RF Tag information. SmartTruck has these capabilities and the ability to control gates, control lights, eyes and other equipment using the built-in PLC. SmartView Outdoor Display Board provides the driver with key information including producer/split data, gross and tare weights, grade factors and which dump pit or load out spout to proceed to. Custom messages can be typed into system and displayed on message board. Fixed Position and PTZ (Pan-Tilt-Zoom) Video Surveillance Cameras provide live video and image capture tied to the scale transaction. This is an excellent way to provide an audit trail of exactly what trucks were processed through your facility. CompuWeigh’s OTP-4800 rugged Outdoor Ticket Printer can print tickets in less than 4 seconds. System includes Pole Mount Kit. The OTP-4800 prints full size scale tickets (typically 8 ½” wide by 5 ½” long), not “gas-pump” style tickets like other competitive systems. Company logo’s and weighmaster signatures can be printed as well. A driver “re-print” button allows drivers to print multiple copies of scale tickets without assistance. Traffic Eyes are used to verify that the truck is correctly positioned on the scale. Two eyes and reflectors are used at the front and back of above-grade scales. Two additional long-distance eyes and sensors are used to monitor the sides of in-ground scales.